It’s been SO warm here in the desert southwest, unseasonably warm! Under a heat advisory, we decided to try to take in the last polo match of the year. 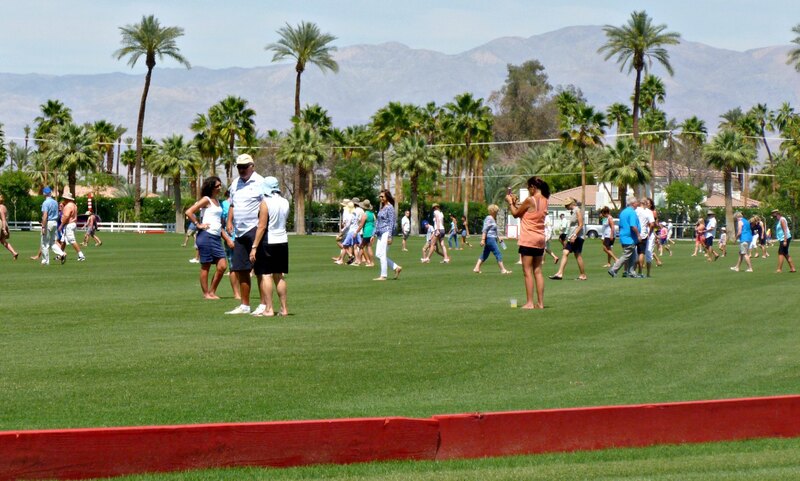 Next week, the polo club will be taken over by three weeks of music festivals (Coachella and Stagecoach). 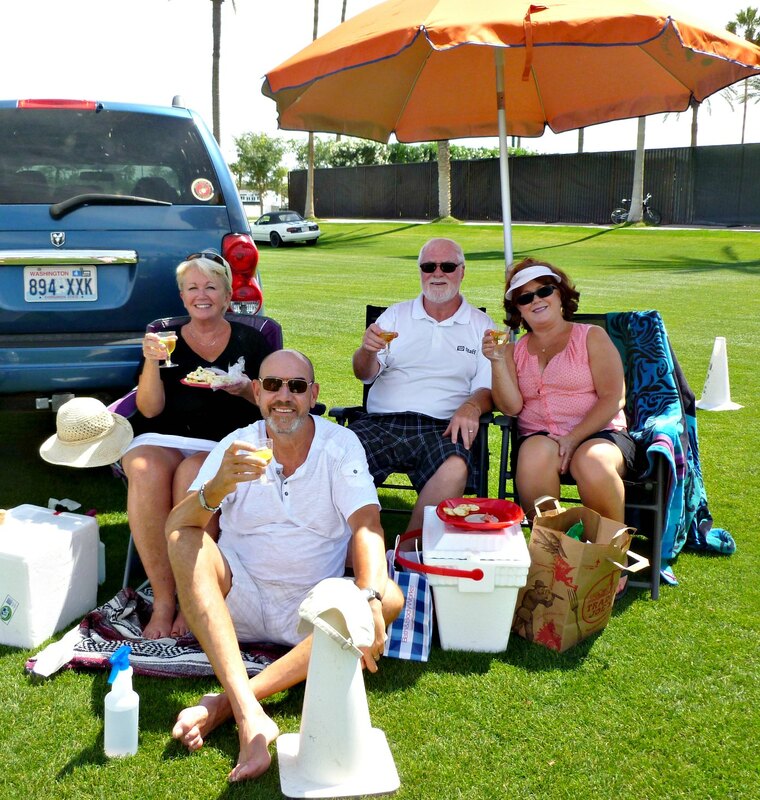 Anyway, we slathered on the sunscreen, gathered our hats, our water bottles, the big Tommy Bahama umbrella, a cooler full of snacks, and our friends Phil & Phyllis – jumped in the SUV, and drove to the Empire Polo Club to tailgate right next to the polo field. We finally found a spot to “set up camp” at the south end of the field. Above is our little group, hovering under the shade of the umbrella, and enjoying a drop of champagne before the match. Next are a few photos taken during the game between “Evergreen” (in yellow) and “Empire” (in red). This was the semi-final match of the year. Apparently the winning team took home $20,000! Remember to click on any photo to enlarge it. Note that all the horses’ tails are wrapped. This is to keep them from getting tangled up in the mallets and/or reins. 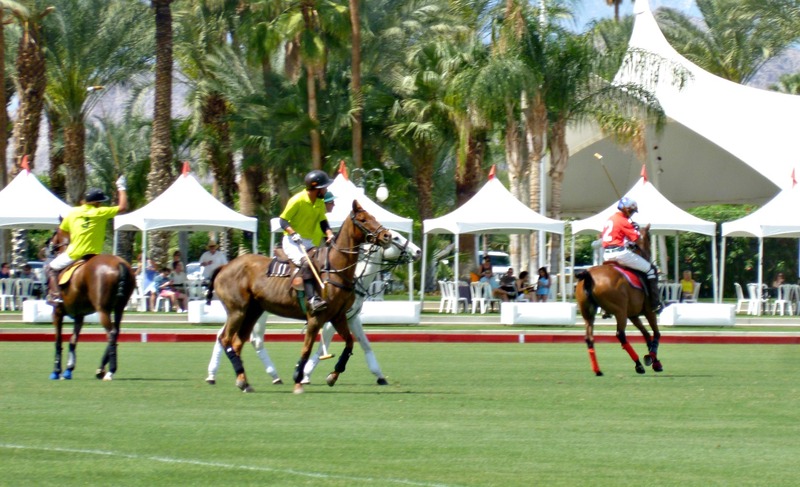 Okay, I will fully admit that even though I am a BIG sports fan in general, I know NOTHING about Polo. It was still great fun, watching all that goes on at a match…. how often they switch out the horses, and learning a few of the rules. In the photo above, you can see the score at “halftime”. That’s my word for it – I truly have no idea what it’s called. 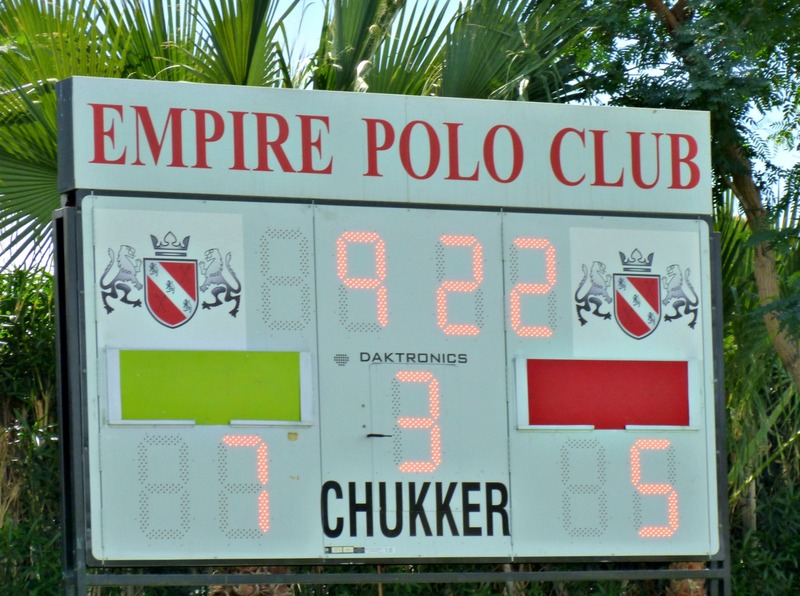 BUT, I learned that the “periods” are called “chukkers” and there are 6 chukkers in a game. At halftime, people dash out onto the field for the “Divot Stomp”! I guess you are supposed to find divots created by the horses and replace the chunks of grass. A nice Canadian gal offered to take a photo of the four of us. Looks like we may have refilled those champagne glasses. 🙂 We also had sandwiches (cucumber and cream cheese – very British and civilized!! ), wraps (roast beef with tomato and tzatziki), cheese & crackers, and some light and tasty lemon cookies (or should I say biscuits?) from Trader Joe’s. After the match, we were all SO HOT and ready for a dip in the pool. Phil and Phyllis brought over the mixin’s for their famous “perfect Margarita”. The results can be seen below… with Suz and Phyllis doing our version of synchronized swimming with a margarita in hand!!! 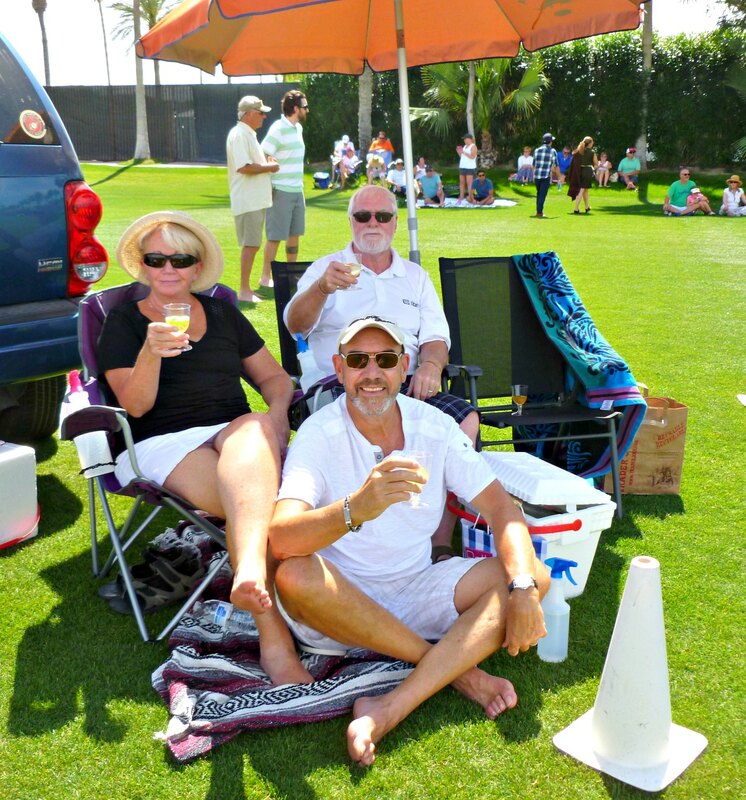 All in all it was a marvelous day – a first for us (P & P had been to the polo club before) with good friends and good fun! 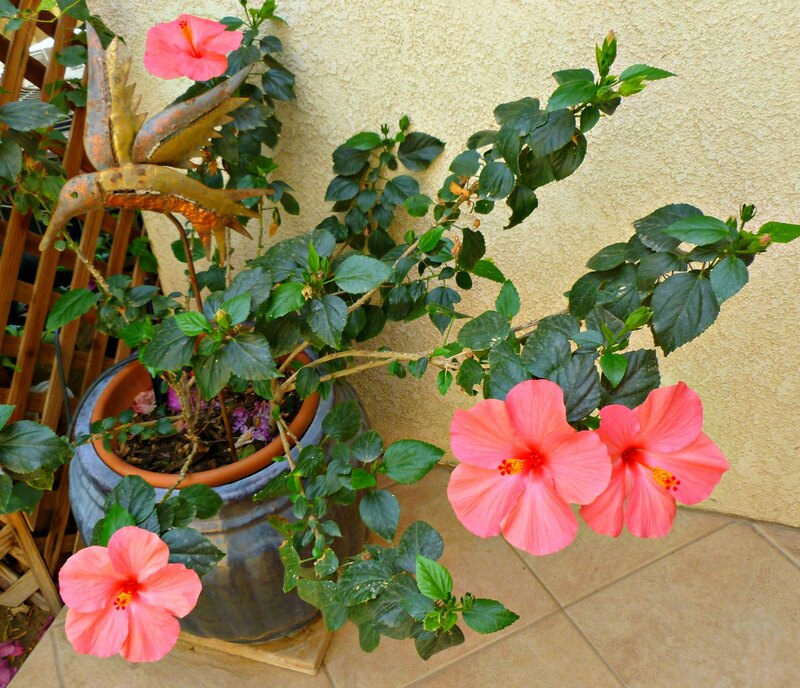 Next is a photo of my gorgeous Hibiscus plant. It’s a rare day when she comes forth with 4 stunning blooms on the same day. I had to get a photo of it for sure!! Did you know that hibiscus blooms last two days, max? It’s so sad to see them in all their glory one day…. and the next – withering on the vine. http://www.youtube.com/watch?v=hdDBFD291J8 You can hear the announcer in part of it, and in other parts you can hear John and Phil commenting on the play. Tally HO!!!! 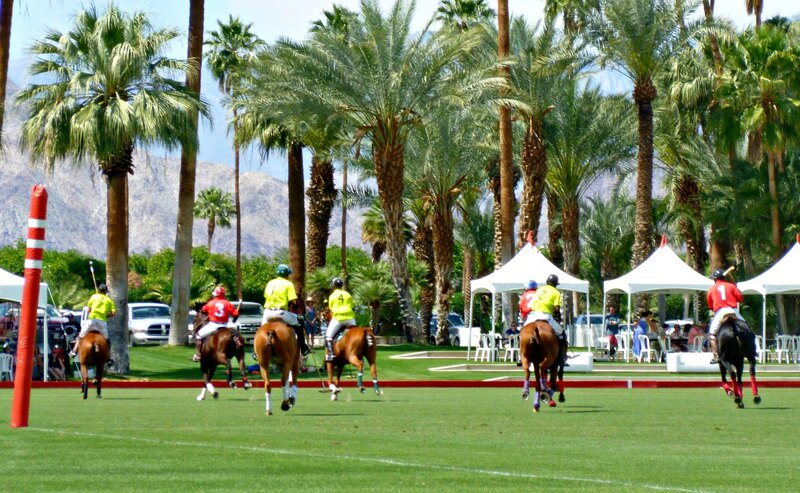 This entry was posted in General Musings and tagged Empire Polo Club, hibiscus, Polo. Bookmark the permalink.